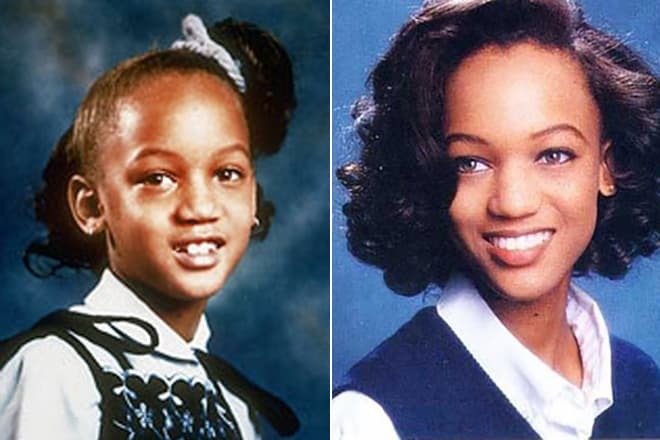 Tyra Lynne Banks was born in December 1973 in Inglewood, California, in a respectable family of Carolyn Banks, a fashion manager and NASA photographer, and Donald Banks, a computer consultant. Tyra was the second child. There was also 5-year-old son Devin in the family. When Tyre Banks turned six years old, her parents divorced. But at the same time, they managed to maintain friendly relations and reduce the psychological effects of divorce on children. At the age of six, Tyra went to school. She studied quite well, but relations with classmates were not good. The girl was skinny and awkward, so she was teased for her appearance. When she grew up, Tyra Banks started to improve herself thoroughly. Soon she turned from a gangling teenager into a beautiful lady. After graduating, Banks became a student at the University of California. But soon she realized that the modeling career attracted her very much. At the age of 17, she signed a lucrative contract with a prestigious modeling agency and began climbing the career ladder. Under the terms of the contract, the 17-year-old model went to Paris, where she caused a sensation after the first runway season. During the first week in the fashion capital, 25 designers offered Tyre a job. Any world-famous model has not achieved such a success at the very beginning of her career. She was the first African American woman to appear on the covers of Victoria's Secret catalog, GQ, and other fashion magazines. Chanel and Ralph Lauren offered her work. Tyra Banks moved to Paris. The young black-skinned model cooperated with such famous brands as Oscar de la Renta, Donna Karan, Christian Dior, Dolce & Gabbana and many others. Her photos appeared on the covers of Harper's Bazaar, Vogue, Elle, Cosmopolitan. In 1997, Tyra Banks won the VH1 award for "Supermodel of the Year." The woman continued to work in the modeling business for 13 years, but in 2005 she decided to focus on her film career. Tyra Banks’s television career began in the 1990s. She played secondary roles in the movie Black or White and New York Undercover. During the same period, she participated in the British television show Fresh Prince of Bel-Air. But it was hard to start a career in Hollywood. Only in 1995, Tyra Banks got a prominent role, and directors paid more attention to the woman. She played in the film Higher Learning together with Omar Epps, Laurence Fishburne, Jennifer Connelly and Kristy Swanson. Tyra did an excellent job. The same year she was invited to the television series MADtv. The end of the 1990s brought Tyra Banks prominent roles. She appeared in the films Just Shoot Me!, The Hughleys, House of the Damned and Love Stinks. Critics highly appreciated all the movies, and she finally joined the ranks of professional actresses. 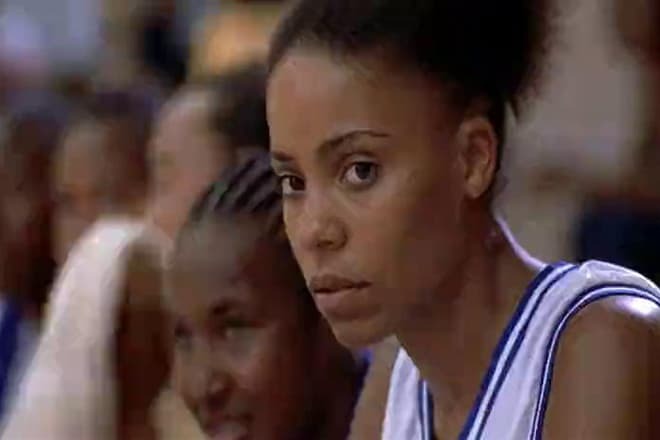 Tyra Banks managed to surprise her fans in 2000, when the film Love & Basketball was released, where she brilliantly played her role and got the audience's love and positive reviews of film critics. The following movies American Dreamz and Halloween: Resurrection made her even more famous. In 2003, Tyre Banks was offered a role in the series America's Next Top Model. At that time, the actress was in the top 5 sexiest and ten highest-paid models. However, Banks played an even more significant role in the comedy film Mr. Woodcock. The film was released in 2007 and immediately became a smash hit. The cooperation of Tyra with famous actors Seann William and Billy Bob Thornton brought incredible glory to the dark-skinned actress. In 2008, the film Tropic Thunder was no less successful. The screenwriter and director of the comedy, Ben Stiller, ridiculed in his project numerous Hollywood films about the war. Tom Cruise and Jack Black got the leading roles. Tyra's part was minor but very bright. In 2009, after the release of Peter Chelsom’s film Hannah Montana: The Movie, viewers, and critics began to talk that Tyra Banks’s acting talent was already quite equal to her modeling success. In this film, the African-American star’s partners were Miley Cyrus and Emily Osment. The television projects with Tyra Banks as a host should also be mentioned. In 2005, the dark-skinned model and actress presented her talk show. It was called The Tyra Banks Show. The format of the TV project was sometimes similar to The Oprah Winfrey Show. For the TV show, the host won the Daytime Emmy Award. In 2009, the TV series True Beauty was released. This unusual project showed that beautiful people did not always behave themselves. Ten most beautiful contestants in America competed to see who was the most beautiful. Tyra Banks and Ashton Kutcher hosted the show. But Tyra had great success after the show America's Next Top Model. Banks was its producer, judge and TV host. The African American model has never kept to a strict diet. She does sports to stay fit. Tyra loves basketball and tennis. She goes in for these sports not only for the body but also for enjoyment. Tyra Banks is a complex personality. She is not only a model, an actress, and a TV host. In 2004 the black-skinned beautiful lady delighted her fans with a lovely singing voice. She released her own single "Shake Ya Body." Previously, the model did not sing, but only appeared in the music videos of many famous performers, such as Michael Jackson, Tina Turner, George Michael and others. A few years ago, Banks published a book Tyra's Beauty Inside & Out. Everyone could see that Tyra was also an excellent author. Tyra Banks’s personal life is full of romantic relations. The beautiful woman, who was in the top five of the most beautiful models in the world, has always had many admirers. But she changed them so quickly that no one can recall most of them. However, her popularity and work in films and television did not allow Tyre to have a family and children. In September 2015, Tyra Banks confessed in an interview for People magazine that she had been trying unsuccessfully to become pregnant during recent years. Tyra has even been through IVF several times. The star complained that she missed the time to give birth to children, which she regretted very much. She also mentioned that she could use the services of a surrogate mother. Since 2013, Tyra Banks has been dating entrepreneur Erik Asla. There is no information about the wedding, but Tyra has said that Eric also dreams of a child.